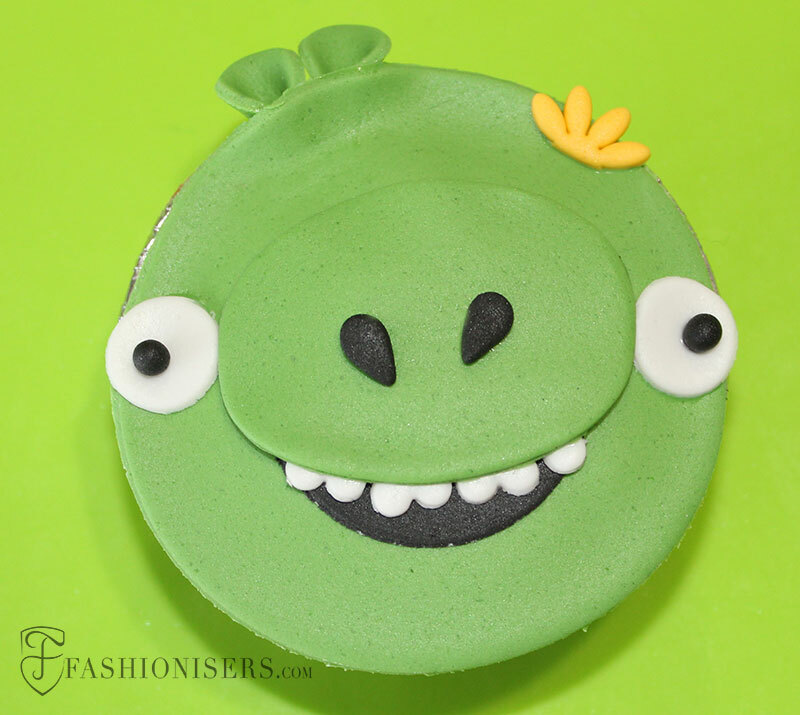 Even the simplest cupcake can look fun, creative and cool when being decorated with the simple gumpaste or the modelling paste as you’ll know it better. 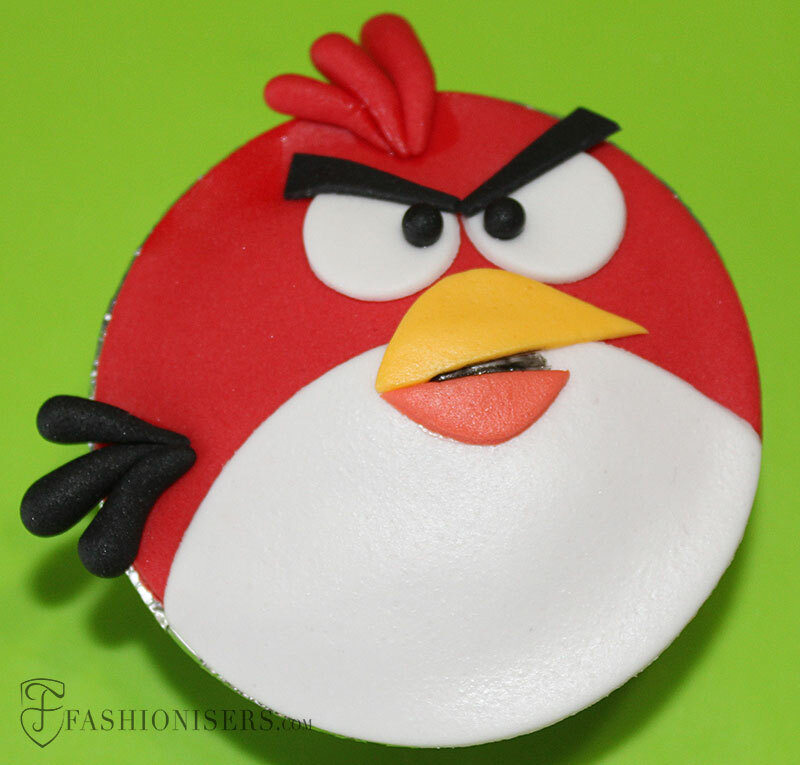 When it comes to gumpaste cupcake decorating ideas, creativity has absolutely no limit, as you can easily transform these simple cookies into the most outstanding work of art, playing with colors, textures and themes. Best of all, when working with gumpaste you always tend to get the most perfect and flawless outcome even if you are a beginner in this field. 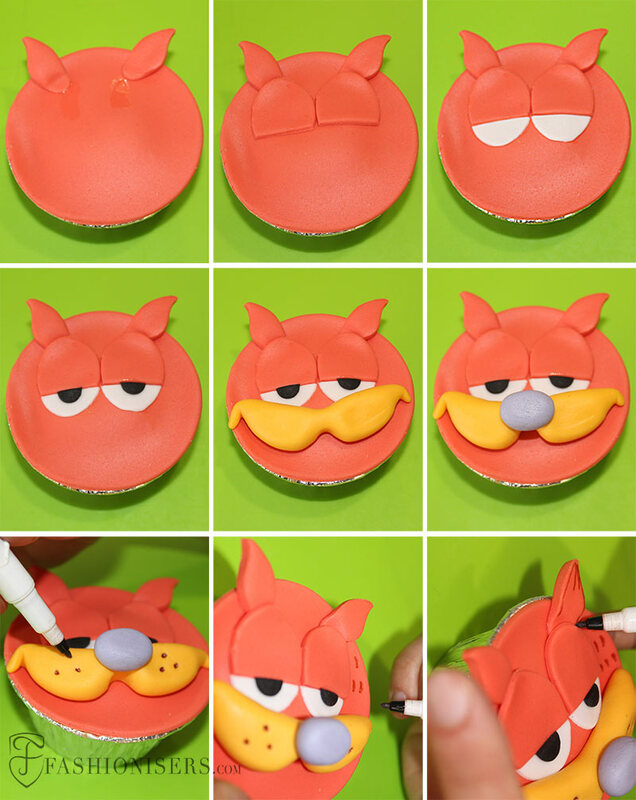 Simply stick to the basic principles of working with fondant (sugarpaste is quite like fondant in its texture and the working principles are the same) and you’ll surely have a success. 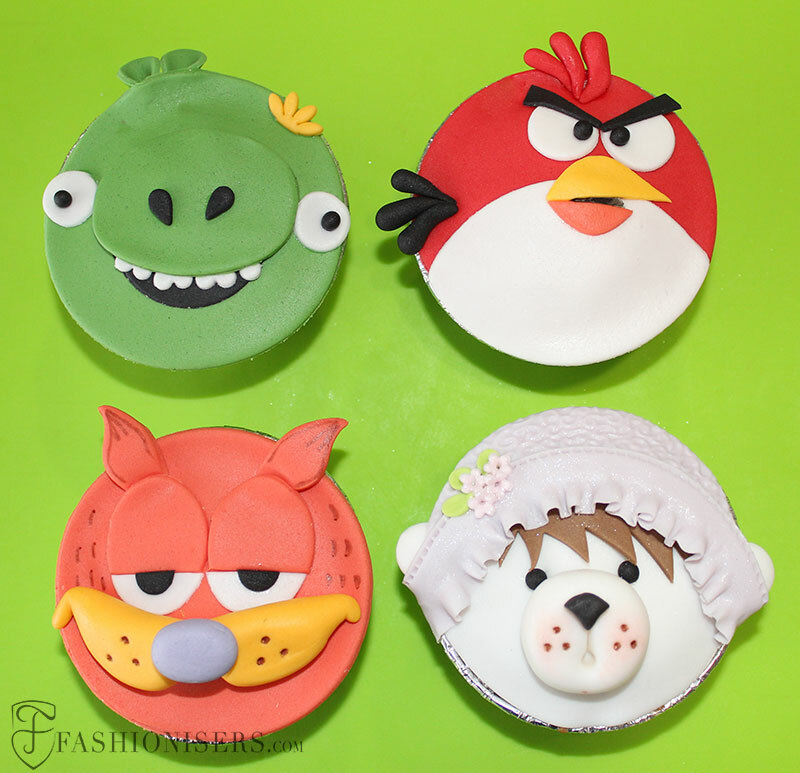 So if you are on the hunt for the most playful cupcake decorating ideas to especially cheer up your children, then the following 4 fun gumpaste cupcake decorating tutorials can be the ultimate guide for you to getting super-dazzling results! Well, of course, the first step is preparing cupcakes, like chocolate ones. You can use your favorite recipe or you can buy ready-made cupcakes. One simple chocolate cupcake recipe is presented below! Preparation: Beat the butter well and then add the sugar. Continue beating it all until getting a light and fluffy texture. Add the eggs one by one, continuing beating the cream all the time. Meanwhile, sift the flour and the cocoa powder in a separate bowl, adding the baking powder and the salt too. Next, add half of the sifted ingredients into the cream, beat it and add half of the butter milk. Add the remaining sifted ingredients and the butter milk and beat it all well. Finally, fill the cupcake cases with the cream and bake them in the oven at 170 degrees C for some 30 minutes. It will make some 12-15 cupcakes, depending on the size of your cupcake cases. Let the baked cupcakes cool down before proceeding with the filling process. To add a zest to your cookies and make them more delicious, we recommend filling in the cupcakes with chocolate cream, for instance. For this, we have used the cone method, which is really simple. 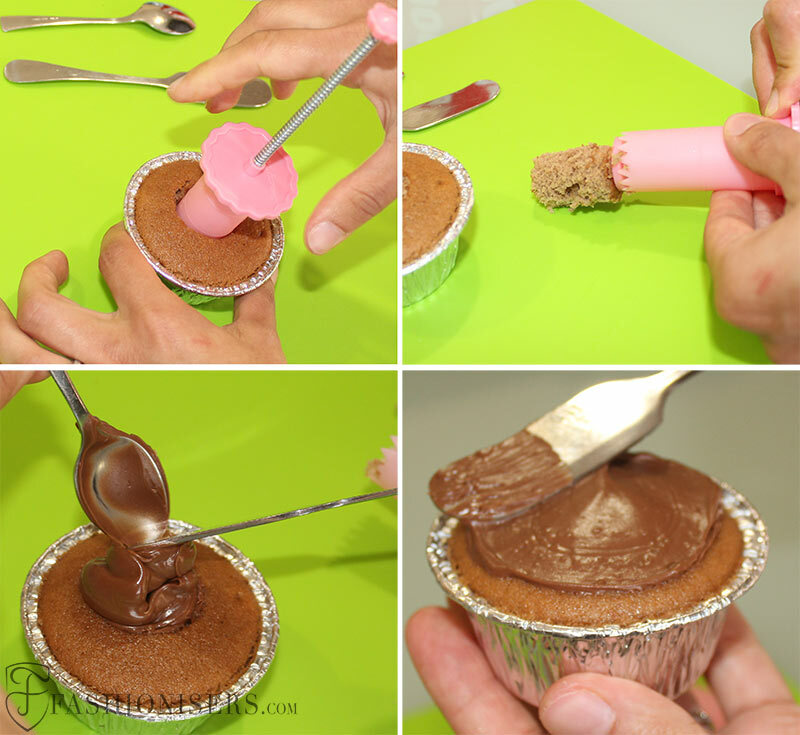 Step 1: Make a hole in the center of the cupcake using a cupcake plunger. In case you don’t have one, you can use a small cookie cutter, a simple knife or an apple corer. Put aside the piece of cookie, as you’ll need it later on. Step 2: Fill in the cupcakes with your favorite filling. It can be some jam, cream, caramel sauce, chocolate mousse or anything else that is creamy and tasty. We have used simple nutella here. Step 3: Plug the piece of cookie into its place (you can cut half of its height, if your filling doesn’t let it plug there thoroughly). Smudge the surface of the cupcake with the same cream, this way creating a sticky background for the sugarpaste. Step 1: If your sugarpaste comes already colored, then start rolling it out. Otherwise, you’ll need to add a few drops of the required gel coloring into it, knead it well and only then start rolling it out thinly. 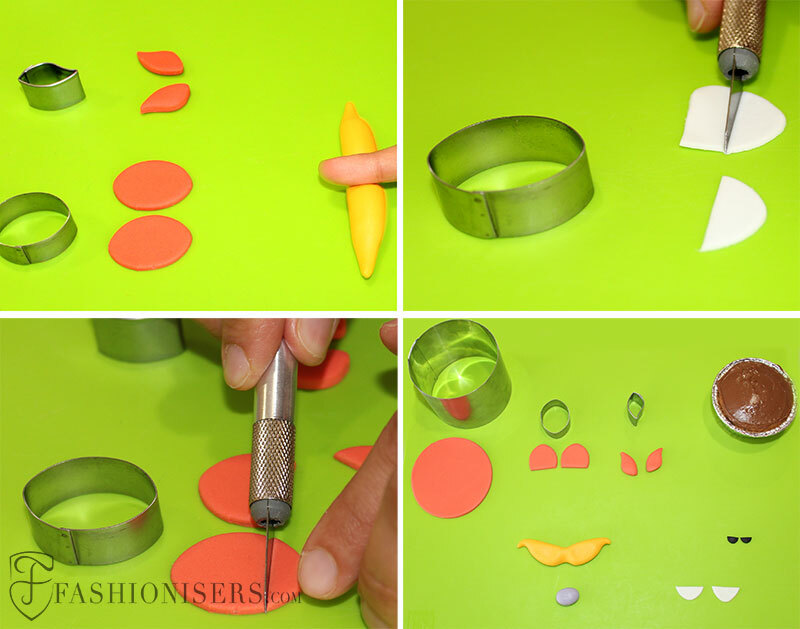 Using the big round cookie cutter, cut out a round shape out of the orangey red gumpaste. This one is for covering the cupcake. It’ll perfectly stick to the cupcake, since you have already smudged some cream on its surface. Step 2: Knead a bit of the yellow gumpaste. Roll it into a thin sausage shape with your fingers, making the edges thinner than the middle part. Place your index finger in the center of the roll and gently press it. You then need to carefully flatten the entire yellow roll with your fingers, creating the mustache of the cat. Step 3: Using the small leaf cutter, cut out two leaf shapes from the thinly rolled out orangey red gumpaste. These will be the cat’s ears. Step 4: Now, take the oval cookie cutter and cut out two ovals from the same orangey red gumpaste, and then two from the white rolled out sugarpaste. All the four ovals need to be in the same sizes. Using the small sharp knife, cut the 1/3 part of all the four ovals, both the red and the white ones. Keep the bigger parts of the cut red ovals and the smaller parts of the white ones. These will be the eyes of the cat. Step 5: Knead a tiny amount of black modelling paste. Press it with your finger, creating a button-like small dot shape. Using the sharp knife, divide it into two equal parts. These will be the eyeballs of the cat. Step 6: Take a small amount of the lilac modelling paste, knead it a bit and roll a small ball from it in a slightly oval shape. Slightly press it with your finger, flattening it a bit. Step 7: Now it’s time to attach all the parts to the cookie. You need to dip the paintbrush into some water and smudge all the particles with it a little prior to attaching them to their places. Here water plays the role of the glue. 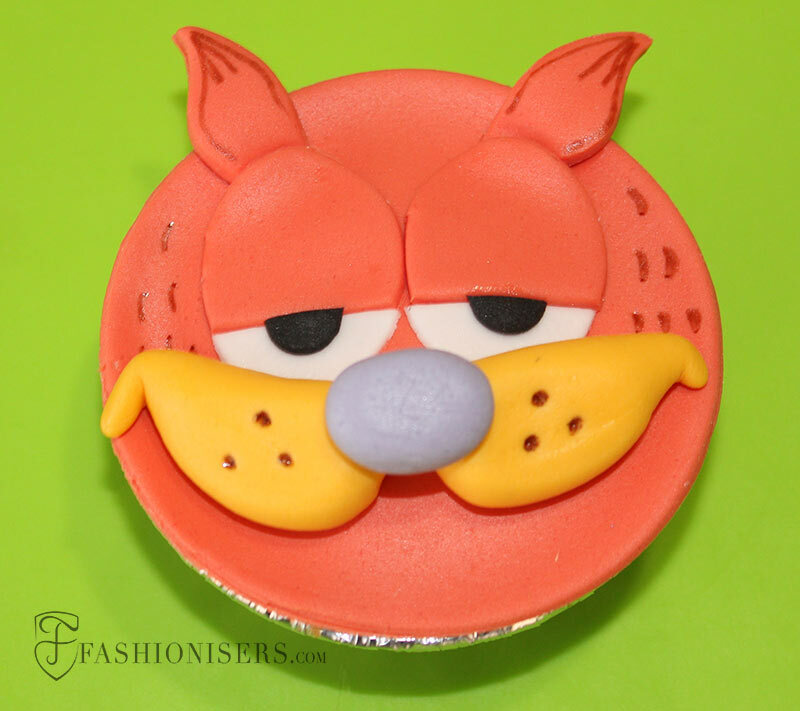 Attach the ears on the top part of the cupcake over the red gumpaste covering. Next, place the cut oval shapes in the red color below the ears, attaching the white ovals below them. Add the black eyeballs and then place the yellow mustache below the eyes. Attach the lilac nose over the mustache. Last but not least, draw some dots and ear shapes with the marker pen, and voila, your first cupcake decorating is ready! 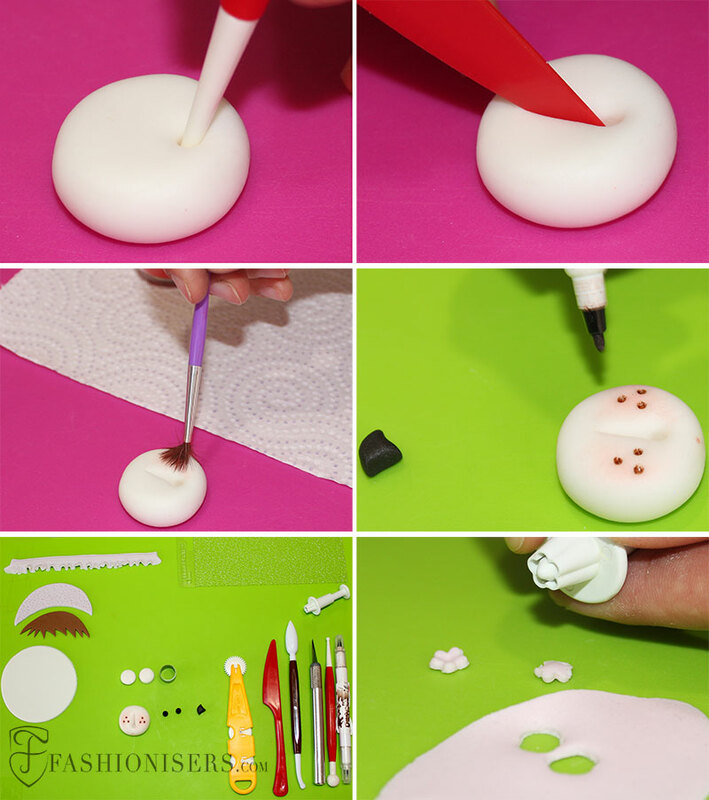 Step 1: Roll out the white modelling paste thinly and using the big round cutter, cut out a round shape for covering the cupcake. Next, roll out the brown modelling paste thinly, and using the same round cutter, cut out a round form. Next, divide the round shape into two equal halves. 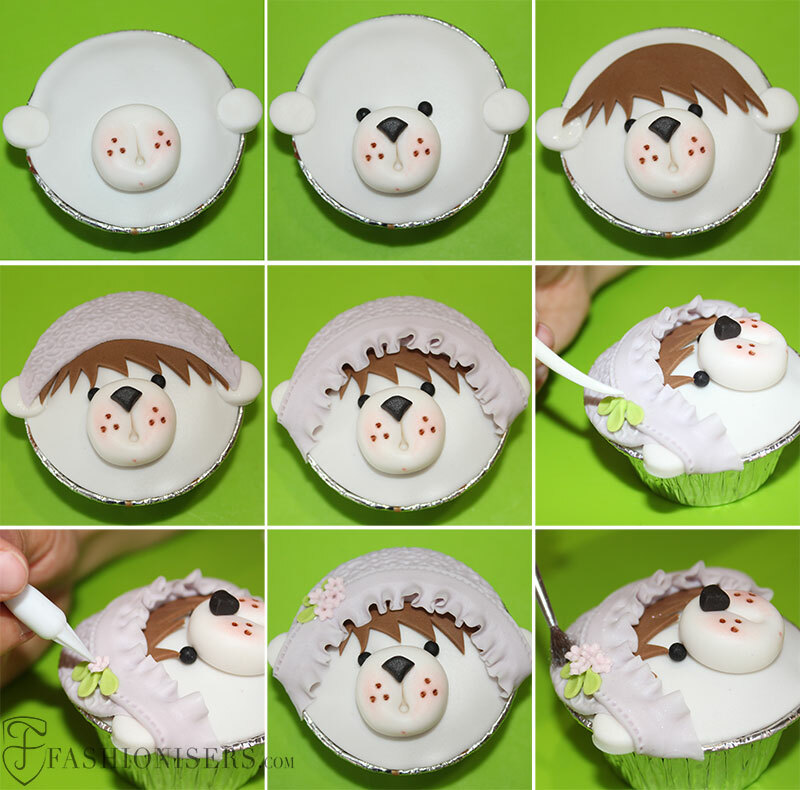 Using the sharp knife start cutting out one edge of the half-round shape irregularly, creating the hair of the bear. Step 2: Roll out the pastel lilac modelling paste thinly. Now, place the gumpaste texturizer on it and slightly press it over the paste using the rolling pin. You’ll get a beautiful lace-like pattern on the paste. Cut off a round shape from this texturized paste using the same round cutter. With your knife cut off a half-moon shape from this round form, put it aside and keep the elongated oval part of it. Step 3: Roll out the same pastel lilac modelling paste thinly and with your knife cut out a thin band. Using the cone modelling tool start ruffling one edge of it. Now, pass the design wheeler modelling tool over the other edge of the band, giving a nice stitch like effect to it. Step 4: Using the tiny round cookie cutter, cut off two round forms from the rolled out white modelling paste. Step 5: Take a small amount of the white sugarpaste, knead it and roll it into a ball. Press it gently with your finger, slightly flattening it. Insert the small end of the ball modelling tool into one corner of it, making a hole there. Now, insert the tip of the plastic modelling knife into the hole and slightly give a longer cut shape to it. Dip the pantbrush into the red powder coloring and slightly dust both the sides of the cut you made. Start adding three dots on each side using an edible brown parker pen. Step 6: Roll out a small amount of the pastel pink modelling paste and using the tiny flower cutter tool cut out four flowers. Step 7: Take some pastel green sugarpaste and roll a tiny sausage-like shape. You need to make three equal shapes like this. With the leaf shaping modelling tool slightly flatten them, making them look like small leaves. Step 8: Roll small balls from the black modelling paste, which will be the eyes of the bear. Next roll a bit bigger ball from the same black paste and slightly press it with your finger to flatten it. Using the sharp knife cut off both the edges of this black flattened ball, making the nose of the bear. Step 9: Now, it’s time to attach all the particles to the gumpaste-covered cupcake. You need to use the same “water’ method for making the particles stick to their places. 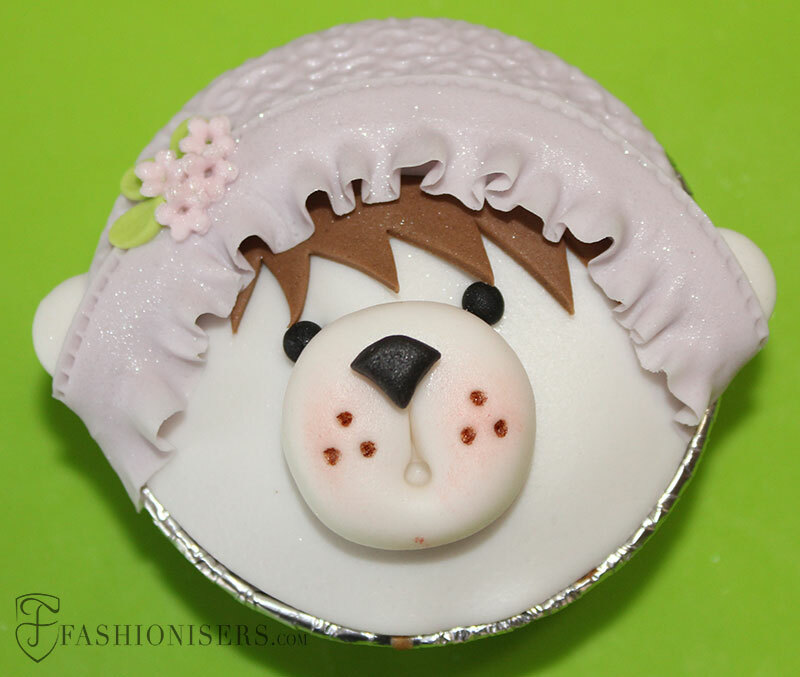 Attach the round ears of the bear to the sides of the cupcake. Attach the mouth of the bear to the central part with the black nose placed on top of it. Next, attach the eyes, the hair, the textured hat with its ruffled edges, embellished with the tiny flowers and the leaves. Dust the hat of the bear with some glitter and you are done! Step 1: Start rolling out the red modelling paste thinly. With the round cookie cutter, cut out a round shape to cover the cupcake, using it as a background for the rest of the particles. Step 2: Roll out a white modelling paste and cut it in the round form with the same round cookie cutter. Using the sharp knife cut out an elongated oval form from this round one. This one needs to be attached over the red background of the cupcake, using a bit water as a glue. Step 3: Using the tiny round cutter, cut off two round forms from the same rolled out white paste. Next, cut off a half moon shape from these round forms using the edge of the round cutter. Step 4: Roll out a bit of the yellow modelling paste and then also of the orange one thinly. Using the sharp knife cut off the mouth and the beak of the bird. Step 5: Roll out a tiny amount of the black modelling paste thinly. With the sharp knife cut off the eyebrows of the bird. Using the same black paste, roll tiny balls, which will be the eyes of the bird, and then also roll the feathers of the bird in a slightly elongated form. 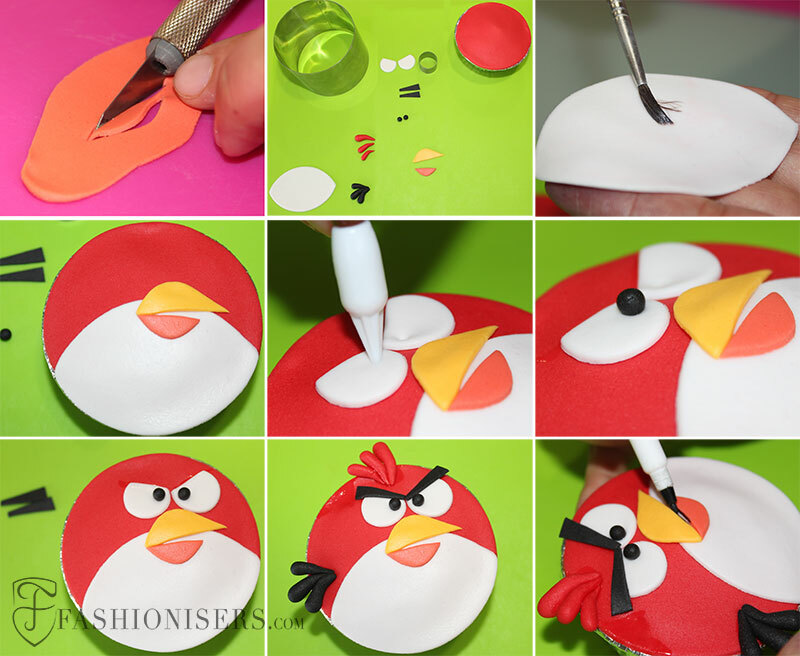 Step 6: Roll slightly elongated forms from the red modelling paste, creating the hair of the hair of the bird. Step 7: Continue attaching the remaining particles to the gumpaste-covered cupcake, adding the beak and the mouth on the white background first. Next, stick the white eyes and then using the star modelling tool make small holes on them for placing the black eyeballs there. Stick the eyebrows, the feathers and the hair. With the edible marker pen, fill the gap between the mouth and the beak of the bird and that’s it! Step 1: Roll out the green gumpaste thinly. Cut out a round and an oval form from it using the big round cutter and the oval one. With the smallest round cutter form cut out two small round shapes from the same rolled out paste. Step 2: Roll out the black modelling paste thinly. With the medium round cutter cut out a round shape from it, which you need to divide into two halves using the knife, keeping only one of them. Using the same knife cut out two tiny teardrop forms from the same black paste. You also need to roll two tiny balls from the black paste. Step 3: Roll out the white paste now. 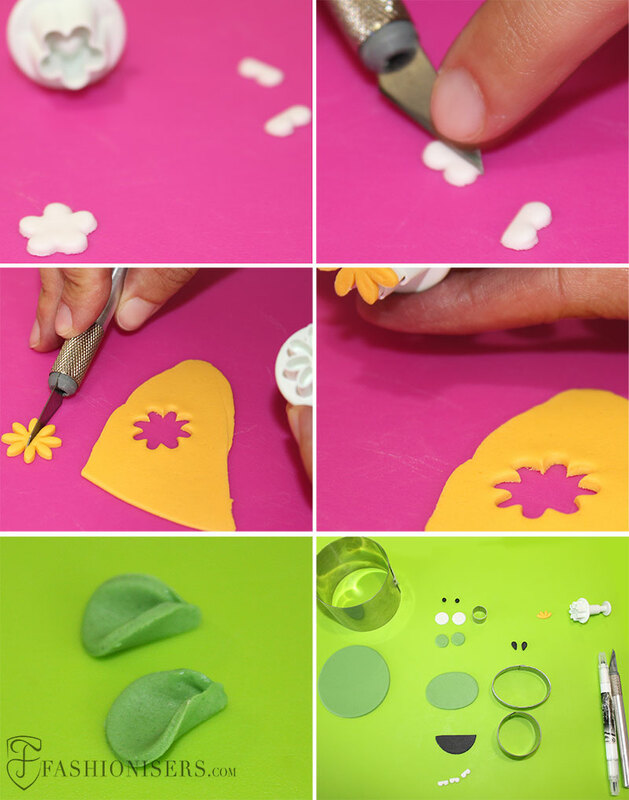 Using the small simple flower cutter form cut out several flowers. Then cut off the two petals of these flowers, which will serve as the teeth of the pig. You also need to use the same smallest round cutter and cut out two round shapes from the white rolled out paste. Step 4: Roll out a tiny amount of a yellow gumpaste. Using the next slightly bigger and different flower cutter cut out a flower. Divide it into two equal halves using the knife, and keep only one of them. Step 5: Last but not least, stick all those particles to the cupcake, starting with the biggest green round form and using it as a background for the rest. Take the two small green round forms, slightly bend them and place them under the green gumpaste covering on the top part of the cupcake. Those will be the ears of the pig. 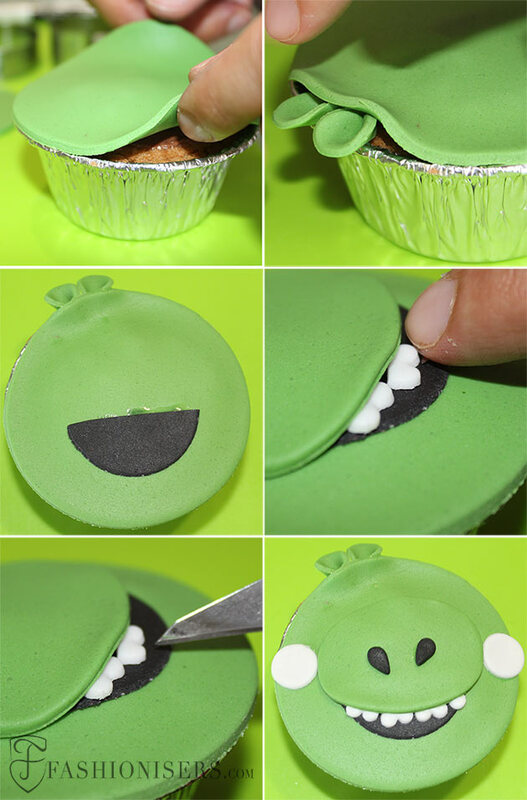 Moisten the black half-round shape and stick it to the center of the cupcake over the green one. Next attach the green oval form to it slightly covering part of the black color. Place the white teeth on the black background right below the green oval shape. Then stick the two black teardrop forms on the green oval shape and the two white round forms on both the sides of it. Finally add the black eyeballs and the lovely yellow flower and another cute cupcake decoration is ready to dazzle! These fun gumpaste cupcake decorating tutorials will help you surprise your closest friends and relatives every time, and make the little children simply adore your cooking-and-baking skills! As you see, you can really do it all on your own!